This security poster illustrates the SB-81 Italian Anti-Tank Mine. This minimum metal mine is designed to be deployed by air scatterable systems. The mine can operate upright or upside down, and it incorporates an over blast system to withstand over pressure clearance. 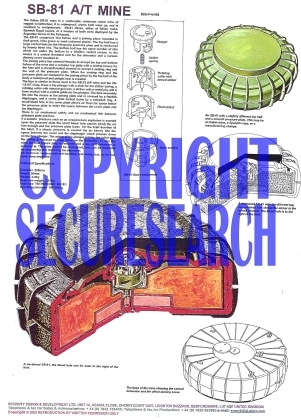 This security poster features the technical specifications of the SB-81 anti-tank mine, labelled SB-81 fuze components, a sectioned SB-81, and the base of the mine showing the central detonator and the offset dummy cover. The security poster also shows an SB-81 mine with a slightly different top half and a smooth pressure plate and a sectioned SB-81 with the different top. An SB-81 mine with a slightly different top half and a smooth pressure plate. A sectioned SB-81 with the different top. The base of the mine showing the central detonator and the offset dummy cover. The technical specifications of the SB-81 anti-tank mine. This security poster features the technical specifications of the mine, labelled SB-81 fuze components, a sectioned SB-81, the base of the mine, an SB-81 mine with a slightly different top half and a smooth pressure plate and a sectioned SB-81 with the different top.